Digitech has dropped the price of the iStomp, its popular iOS device programmable effects pedal, to only £49. If you're not in the know, the iStomp allows you to access one of 47 e-pedals from the iOS Stomp Shop app, and thus use your iOS device to basically access any pedal you need, whenever you need it. 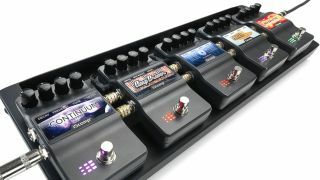 For more information visit the official Digitech website. DigiTech has repriced its iStomp FX pedal - a stomp box that can be totally reprogrammed using an iOS device - to an ultra low price of just £49 inc VAT. Alongside the price reduction of the unit itself, all available e-pedals (with the exception of the Adrian Belew artist e-pedal) are now free. The flexibility and sound quality of the iStomp makes it an indispensable additional pedal to have in your gig bag to use whenever required, for whatever required. Available e-pedals include various overdrives, distortions, pitch shifters, delays, an acoustic simulation - even a Lexicon® Hall reverb.